You have enough in your washing machine, there's no need for a tablecloth too. With our White Tablecovers, you'll be able to get that clean and pristine look without the extra step of washing it. Now you just have to throw it away, and sit back and relax after that big party of yours. 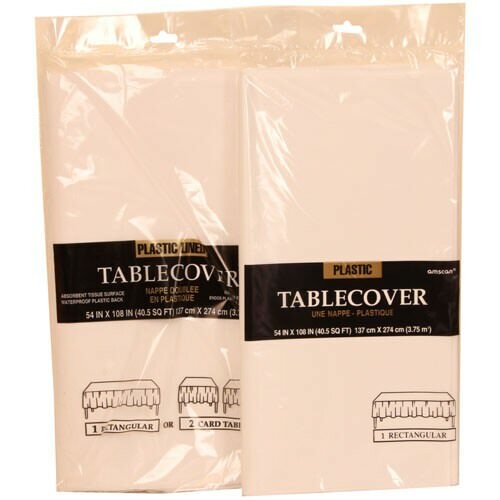 White Table Covers are one of our best selling table covers for a reason; they go great with any theme for any occasion. From barbecues to birthday parties, from backyard weddings to baby showers, a white table cover is a simple way to keep things clean and bright. We know that it's hard work throwing a party, so don’t make cleanup more difficult than it needs to be. Instead, use a white table cover. White Table Covers feature a large rectangular shape of 54 x 108 allowing them to cover most any table. They are available both plastic and paper.